Are Heinz baked beans still worth their 79p price tag? KU asks: Do Beanz really mean Heinz? The River taste test five tin of supermarket beans against baked beans giant Heinz, to find out if after 50 years, the big ame brand is still worth the price tag. This year marks 50 years of Heinz famous and iconic baked-bean slogan ‘Beanz Meanz Heinz’. To celebrate 50 years of the well-known saying, which was brain stormed in 1967 by Maurice Drake, Heinz have released limited edition labels on their tins of baked beans. 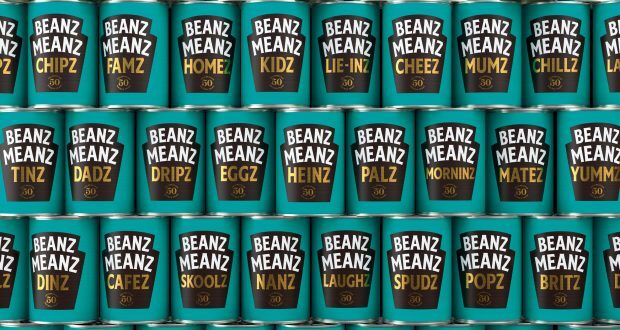 The famous line ‘Beanz Meanz Heinz’ was voted the UK’S favourite advertisement slogan in 2012, which knocked Nike’s ‘Just do it’ from number one. On their 50th anniversary the question on everyone’s lips is, do Beanz really mean Heinz? We wanted to test if you could really taste the difference between Heinz Baked Beans and supermarket own beans. Six 415g cans of baked beans were chosen from six different supermarkets in and around the Kingston Town Centre. Each can of beans were stripped from their labels so none of the taste testers knew which brand they were tasting. Blind bean 1 was Sainsburys own brand, which was given a 6/10. The tasters said it appeared juicy and had a good bean to juice ratio, however when they tasted it the beans tasted dry and left a strange residue in your mouth with a very bland flavour. Costing 30p per can these baked beans contain (per ½ can): 0.9g of Fat, 1.5g of Salt, 8.5g of Sugar and 9.2g of Protein. Blind bean 2 was Baked Beans in a rich tomato sauce by Simply M&S. The tasters gave the beans a 9/10. The beans were very fragrant and had lots of flavour which tasted like paprika seasoning and would happily eat them again. These M&S beans also cost 30p per can, containing (per ½ can): 0.8g of Fat, 1.2g of Salt, 10.5g of Sugar and 10.2g of Protein. Blind bean 3 was by Aldi, which received a 5/10. The beans appeared very dark in colour, however they tasted quite sweet. It was a mixed bag as some tasters enjoyed the sweetness and some said it tasted too artificial. Costing 29p for a can, these Aldi baked beans contain (per ½ can): 0.3g of Fat, 0.83g of Salt, 12g of Sugar and 9.7g of Protein. Blind bean 4 was by Waitrose Essentials and got a 7/10. The tasters enjoyed how saucy the beans were and really liked the richness of the sauce. These beans are slightly more expensive costing 32p, however nutritionally they contain: 0.8g of Fat, 1.5g of Salt, 8g of Sugar and 10.2g of Protein. Blind bean 5 was the well-known Heinz, the tasters gave the beans a not so juicy 2/10. The tasters expressed their disappointment in the colour of the beans and that they tasted bland, cheap and horrible. These beans came in as the most expensive costing customers 79p for one can of Heinz Baked Beans. Per ½ a can they contain: 0.4g of Fat, 1.2g of Salt, 9.8g of Sugar and 9.7g of Protein. Finally blind bean 6 was Lidl’s baked beans and received a 6/10. The tasters described the beans as smelling very fragrant and having a thin tasty sauce. These Lidl beans are the same price as Aldi’s own, you can buy them for 29p. ½ a can contains: 1.3g of Fat, 0.95g of Salt, 8.5g of Sugar and 9g of Protein. Unfortunately the results show Heinz baked beans in last place only scoring a 2/10 and the M&S baked beans coming in first place scoring a winning 9/10. The tasters said that the winning M&S Baked Beans were juicy and flavoursome, however it contained doubled the amount of fat in half a can compared to Heinz. Despite Heinz having a low fat and salt content, the sugar was higher than some of the other brands, containing 9.7g of sugar for only ½ tin. The taste test proves it, Beanz doesn’t mean Heinz, it means M&S.